Software development company VX Company partners with no-code platform provider Betty Blocks to develop IT solutions faster, better and stronger. 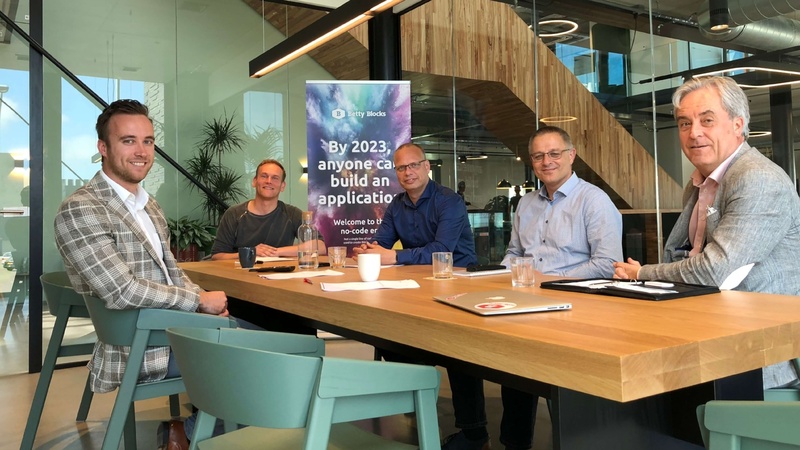 PRESS RELEASE: The Netherlands - 17 July 2018 - Betty Blocks, the leading no-code application development platform provider, today announced a new partnership with software development company, VX Company. This partnership will provide customers with a high-productivity platform and an experienced team to build the right digital solutions. The partnership was formed when VX Company saw the value of Betty Blocks through an evaluation of low-/no-code platforms. Software is becoming more and more pertinent in business and there’s no end in sight. Organizations need applications for immediate solutions as well as strategies for a digital transformation. With long IT backlogs and a lack of developers, many organizations fall behind on their initiative to innovate. No-code platforms have been proving to be an alternative tool for organizations seeking to build applications faster and innovate as quickly as their ideas. “Companies can digitize processes much faster by acting on their ideas quicker,” Chris Obdam, CEO of Betty Blocks, said. “Before the use of high productivity tools, it required a long, tedious process to realize an idea into a solution. Ideas would also be much more difficult to translate without a proof of concept. If the customer with the idea can have a larger role in the development, then the solution is developed closer to the expectations. Now as soon as organizations have an idea of what they want to fix in their processes or a new method of carry out work, they can bring their idea to VX Company who will help shape and build the viable digital solution. VX Company and Betty Blocks came together over the shared initiative to provide the best IT solutions for organizations in a constantly changing digital industry. Not only is the IT landscape changing, the possibilities for application development are changing as well. To stay innovative with their application development, VX Company conducted an evaluation of low-/no-code platforms and invited vendors to present their platform. Betty Blocks demonstrated how collaborative their platform was by involving VX Company in the process of building an application. The process VX Company uses to build applications is called the Smart @ Vantage approach. This approach is intended to get a project off the ground as early as possible using the company’s own Agile method. Spanning across 5 days, the project begins with understanding the core of the challenge, the goals, and the opportunities and risks. The second and third day consist of defining the plan of the project as a strategy. Following the plan, VX Company provides a framework for reaching the goal of the project. Beyond the three step planning approach, VX Company also offers a proof of concept. Now using Betty Blocks, the proof of concept is a quick and easy preview of the solution that achieves the project goal with continuous iteration. VX Company is an IT specialist where the best professionals and consultants work on the smartest solutions. They believe that IT is 100% human effort. They are experts in building custom made software to support our customers with their specific business processes allowing them to create competitive advantage in their market-segment. From the initial idea, via design and development to testing, production and management: they work together with our customers to create the perfect application for their organization. VX Company follows the principles of Agile/Scrum and DevOps/Continuous Delivery, so (intermediate) results are frequently visible and available, allowing our customers to control the ultimate result along the process. Visit VX Company at https://vxcompany.com/, follow them on Twitter and LinkedIn.